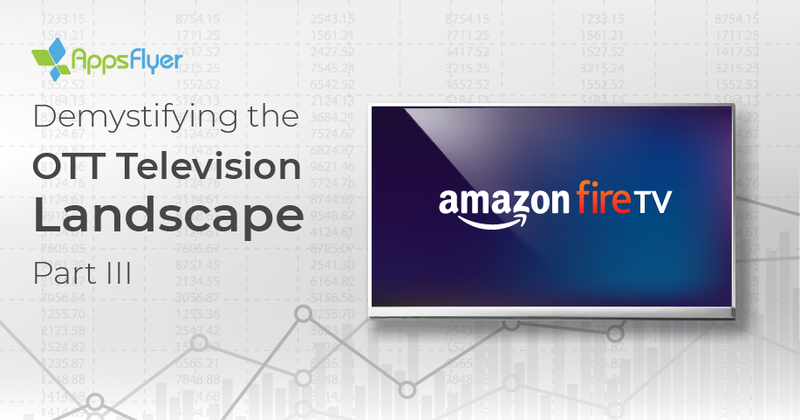 We recently announced AppsFlyer’s integration with Amazon Fire TV as part of our ongoing mission to provide 360° measurement of the digital ecosystem. After months of beta testing with select advertisers in Q4 2018, we are excited to share more details on the integration, which is now publicly available for any Fire TV app owner. Amazon has been a juggernaut in the over-the-top (OTT) television market, recently announcing 30 million monthly active users — a figure that seems to top Roku as the #1 streaming device worldwide, CNET reported. Fire TV’s rapid growth is consistent with the U.S. connected TV (CTV) market overall, which grew by 55.5% last year, representing 55% of the population, according to eMarketer. This presents a tremendous opportunity for TV publishers to expand to new platforms. Because Fire TV is built off the Android OS, migrating your TV app from Android to Fire TV is a relatively seamless process. In addition to organic expansion, the advertising opportunities on Fire TV present new efficiencies in the form of advanced targeting and native display ad formats. TV has long been used as an awareness channel, replicated on Fire TV in the form of in-stream video advertising. However beyond video, the availability of clickable ad formats positions Fire TV as a viable option for mid- to lower-funnel advertising as well. Fire TV offers a variety of placement options, such as “inline ad placements” which appear on the home screen. Because these ads are clickable and offered in a native format, they translate to far lower eCPIs than their video counterparts. In addition to direct advertising on Fire TV, marketers can also expand their cross-screen reach by using Amazon DSP for mobile and web lifecycle advertising. Although Amazon Fire TV offers 1st party reporting on a variety of metrics such as impressions, clicks, detail page visits, downloads and subscriptions, integration with AppsFlyer has a number of advantages. In addition to facilitating aggregated reporting across OTT platforms with standardized attribution windows, AppsFlyer allows you to setup unlimited in-app events such as program searches, program views, and ad completion rates (for ad-supported TV apps). Amazon’s 1st party reporting currently does not have visibility into in-app events, making integration with AppsFlyer essential for advanced analysis, audience segmentation and optimization for user acquisition and re-engagement (learn more by reading our OTT measurement blog post here). For more information, check out our step-by-step guide for Amazon Fire TV integration, contact your AppsFlyer Success Manager or schedule a free consultation with an AppsFlyer expert.